Tuesday is usually reserved for a tempo run. I am usually forced to run these on my own because it is a Tuesday and most people are in the middle of their hustle and bustle already by the time I go out. Instead, a day before I received an email from teammate Kevin asking if Drew and I would like to join him and Jay at the track Tuesday evening instead. "What a treat!" I thought. Unfortunately Jay was having heel issues and decided to play it safe on his own instead. I was able to get a hold of Drew, so it was the three of us verses the clock. Coach John Hill formulated a track recipe that would be a delicious appetizer for this Friday evening's 5k Longest Day race at UBC 7pm. When we arrived were greeted by some of Canada's Jr. National speed walkers. Interesting to watch them but I'm not sure I have the patience for it. It's always a pleasure to be around athletes of that stature though. Even if they are younger, I still feel slightly humbled by younger runners/athletes who compete at a national level. I sure wish I had some spikes that were the right size, because these are the shortest distancesI have run on the track in a long time and I'm sure I could have been slightly faster with more grip and responsiveness. 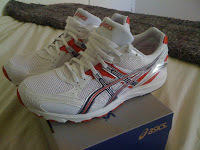 However I did not and was saving my Asics Hyperspeed 4's for race day because of their rapid tread deterioration. This will probably not be a factor on the rubber track, so from now on I will not hesitate to bring them out to the track. 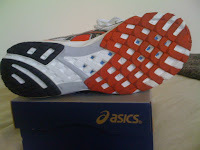 (see photo) Until I geta decent pair of spikes. If you're out there Forerunners, I could use your help, All my shoes needed replacing this year and It's really expensive! Just for an added shout out, Forerunners is the best store in Vancouver for your running needs and have great prices too. Their staff (esp. Jerry Ziak) are extremely knowledgeable and helpful and always find me the right shoes. Alright, enough with my shoe fetish already, back to the workout at hand. First off 400m warm up at 70secs. It felt definitely quick as the last time I was here, I was moving a lot slower. Straight into our 200m all out sprint the three of us shot! This is a fun one because just when I think I can't go any faster at 100m I find a little more inside to let out and push to the finish just behind Kevin in 27secs. Good thing we have 600m to rest because we are all breathing very heavily. Man, Bailey, Bolt and the rest of those Olympic sprinters make it look so easy! Trust me, without this type of training, your legs will only move so fast. Deep exhales as we come up to the start of our 800m and we're off again. We were moving so quickly through the first lap, it didn't feel much different than a 400 should to me. I wasn't sure if my legs would be able to carry me as I rounded the bend to the 600m mark. I dug deeper as Kevin pulled as hard as a Clydesdale up front and hung on with all my might. At this point it was my lungs that I could feel the resistance on. Perhaps it was that cider I had while paddling my neighbour's canoe around False Creek earlier in the day. In any event it was soon over, only to return to our recover jog around the track for a much needed 600m rest. We doubled back as to duplicate our first 200 exactly and we almost did just that! I could feel that we were slightly slower at the first 100, but at least I surprised myself by feeling refreshed enough to pour it on all the way from there. I almost passed Kevin and could feel Drew breathing down my neck on this one as we crossed the line one second slower in 28 secs. Not bad after such a demanding workout. Please note that Kevin (an Asics and Peninsula Runners pro runner) was wearing a brand new pair of Asics Hyperspeed 3's and Drew (a New Balance Pro) was wearing some New Balance spikes. I'm super glad that Kevin and coach had the brains to create this workout and that Drew and Kev were able to join forces with me to knock this one off. Without them, my efforts would have been sub par. I am feeling ready for this weekend's 5k and even the Scotiabank Half Marathon on the 27th. Two new Personal Records to look forward to and two steps closer to the cream of the crop. Harvest season is this fall and my resume will be lookin' ripe for the pickin'! See all you speedsters at during and after the race. Stay tuned for the exciting outcome and always remember, good luck and HAVE FUN! Things I love - People who are willing to lend a hand when needed. I am coming to Vancouver soon from Toronto and would like to join a running group. Is there any groups along point grey that meet for morning evening jogs daily? ?